Are customers loyal to the brand, or are they (just) loyal to the discount? In the last few decades, the word “loyalty” has gone from representing a strong feeling of support, allegiance, and even love, to being synonymous with points programs and cards. Yet it’s the original sentiment that is most important in the relationship between a brand and its customers. Curiously, many brands still rely primarily on points, discounts and rebates as a means of influencing customer behavior – oddly enough, even brands whose positioning is not focused on price or savings find themselves in this position. 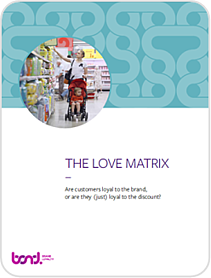 The Love Matrix, the two-by-two matrix created by pivoting brand love and program love together, reveals some interesting insights related to brand loyalty and hints at effective strategies for marketers.